Kirk R. Smith is a professor at the University of California-Berkeley and chair of the expert group evaluating household air pollution risks for the Global Burden of Disease, and the 2012 Tyler Laureate for Environmental Achievement. The views expressed are his own. About the worst thing you can do is stick burning stuff in your mouth. Every year, tobacco kills more than six million people, according to the World health Organization. Including secondhand tobacco smoke affecting non-smokers, it is the chief cause of ill-health (measured as lost years of healthy life) among men globally and for everyone in North America and Western Europe. The terrible disease burden imposed by tobacco is recognized by most people, but the risk of another form of smoke is also highlighted in the new “Global Burden of Disease” report released last Month in The Lancet – smoke from cooking fires. About 40 percent of the world still cooks with solid fuels, like wood and coal, in simple stoves that release substantial amounts of the same kinds of hazardous chemicals found in tobacco smoke directly into the household environment. Indeed, a typical wood cookfire emits 400 cigarettes worth of smoke an hour. This “household air pollution” is responsible for about 3.5 million premature deaths each year. Perhaps it is not surprising that the impact on health is so high when one considers that this smoke particularly affects a very vulnerable group – poor women in developing countries. Babies do not smoke, but do spend time in kitchens with their mothers. Thus, in addition household air pollution has a major impact on young children. The death toll includes half a million child pneumonia deaths. Remarkably, although the new assessment did not address all possible risks to health, among the 60 major ones examined, household air pollution is second most important for women and girls, right between high blood pressure and obesity, two causes of disease impacting all countries. 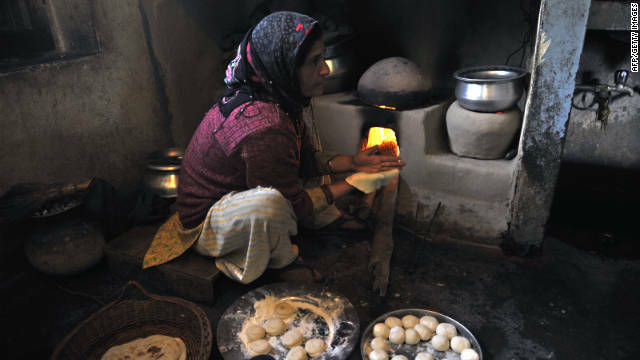 In the poorer regions, such as South Asia and most of Sub-Saharan Africa, where cooking with solid fuels is common, household air pollution is the most important single risk factor for women and girls. Outdoor air pollution is also largely due to smoke from fuel burning. Some 3.3 million premature deaths annually are attributed to outdoor pollution across the globe. We now know that a good portion of this pollution actually comes from household cooking fuels – more than a quarter in India, for example, and more than a sixth in China. This pollution may start indoors in the kitchen of a poor family in a rural community, but after exiting the house, it spreads downwind to form part of the local and national outdoor pollution that affects millions more people. This “secondhand cookfire smoke” adds nearly half a million to the death toll. Along with its primary impact, this brings the total impact of household air pollution to nearly 4 million premature deaths, by far the single most important environmental health risk in the world. Not addressed by the new study is what can be done. First, do we need do anything at all, or will this problem go away on its own? Our ancestors started cooking with wood nearly at least a million years ago. Today, 60 percent of us cook with gas and electricity. From this perspective, there is progress. In terms of the number of fires burning each day, however, progress is hard to see. Today, 2.8 billion people use these fuels, more than any time in human history. Indeed, more people cook with solid fuels today than the entire world population in 1950. It is thus not a problem that is going away naturally but requires concerted action to vastly increase the number of people cooking with gas and electricity. We understand the technology for these fuels, which are intrinsically clean, but society has not taken on the organizational and financial challenges to promote access in poor populations to technology 60 percent of us take for granted. For those that cannot be reached soon with clean fuels, there is need to develop and deploy truly clean-burning stoves using local biomass fuels that produce very little smoke. Only then will a significant number of lives be saved. Unlike gas and electricity, however, this poses major technical challenges since there are few examples of such stoves anywhere. Much more sophisticated engineering is needed to develop them. Much more innovation is needed also in ways to sustainably disseminate such advanced stoves to meet poor people’s needs. The international community finally responded to the long-established impact of smoking with the 2005 Tobacco Control Convention. With cookfire smoke now recognized to cause two-thirds of the horrific impact of tobacco, perhaps it should consider work toward a 2015 Cooksmoke Control Convention that would focus on providing viable clean alternatives for the world’s poor. Next entry »A new era for the Eastern Mediterranean? New labor in poverty stricken areas through economic development + a huge party + a healthy dose of Fareed every week so that we stay grounded. Fine. Lets open the doors to immigration of young women from these countries; more and more American guys are looking for foreign brides. Its a win-win. Feminists do want to help their sisters overseas, don't they? Don't they? Dissemination of the right types of stoves is one good option, though we should also address the conditions that people live and work in–namely, social determinants of health. Can people afford these? Are they educated about the dangers of such things? I think if you address global poverty through focusing on economic development, people could rise out of poverty and then live in a better type of environment where either they can afford a better type of stove/source of fuel, or even transition to it out of necessity. There are over a million people dying of hunger while we are wasting money on endless wars. i guess it is not news. Hemp is one of the most useful crops there is. Anything that can be made from oil can also be made from hemp. It is easy to grow, it's a renewable resource, it's biodegradeable. It grows in most areas of the US but if we want to use it it must be imported. There would be factories that would provide jobs. If the president is truly interested in putting people to work he would get that law changed. We would then have made in America products for domestic use as well s to export. It would be a win-win for everyone, especially his legacy. You can make fertilizer, plastics and gasoline out of hemp? More nonsense. Hemp has marginal uses other then helping legalize marijauna. I have the greatest respect for the work of Kirk Smith, his fellow 'stovers' and the Global Alliance for Clean Cookstoves, but I am dismayed that they continue to dismiss the potential of solar cookers to dramatically reduce the need for burning biomass in any kind of stove. There are more than a million parabolic solar cookers used by families in western China (where the harsh weather includes little rain and lots of sun) to keep big kettles of water boiling all day long even in the winter. Almost that many are being used in India. Tens of thousands of refugees in the Sahel are cooking their traditional foods on inexpensive cardboard and foil solar cookers. In Latin America solar box cookers are used by bakers and in small restaurants. Why should the poorest people on earth burn anything on a sunny day when they can cook their food and boil their water with clean sunshine. Go to the website of Solar Cookers International (www.solarcookers.org), read a few issues of The Solar Cooker Review (I'm the editor) or look at some of the videos on solar cookers on my youtube channel - solarwindmama. This is a story that CNN should be telling. So true as biomass burning has other very dire consequences. I've watched the tree's literally disappear in Cambodia due to the poor making cooking charcoal. Any other type of cooking is non existant in the countryside the landscape looks like the moon. Also countries in sub-sahara Africa, which is contributing to the expansion of the great desert. Environmental damage wasn't even mentioned in this article where I think it should have been. I"m totally with you on solar cookers as the majority of countries along the equatorial plane are the one's in most need. so hot that it burns all solid emissions and the most of the organic gaseous compounds. A distinction should be made between such a 'hi tech' stove and the primitive campfire-type cooking where the smoke blows in your face. You have put it in very right perspective. The amount of smoke coming out of the fire is so obvious. Mr. Kirk simply has some skewed agenda here. Has he ever studied impact of chemically treated wood and coal that is used in camp fire and fire pits over here. Kirk, try to study impact of smoke and gases that comes out of during the process of grilling and roasting your favorite raw meat. Maybe tobacco manufacturers and exporters should be tried at the league of Justice?? Ugh! That's a kitchen?! Maybe I should think twice before complaining about mine. What's wrong with it? That woman, would, I bet, keep that kitchen as spotlessly clean as it is possible to have it. And the food she's cooking probably isn't all lazy slob junk food direct from the microwave. I would totally agree with you. I'm sure her kitchen would be chemical free and cleaner than many kitchens in monern households. With her limited means she is cooking fresh hot meal for her family- A way to promote good health and develope better immunity . Her bread would certianly not have laundry list of ingredients/preservatived that off the shelf breads would give you. People use the fuel they can afford in the homes they can afford... Selling wood as fuel is often a useful industry that employs many poor and unskilled workers. Gas and electric stoves are dependant on the government which can't always provide reliable stocks of either, especially in rural areas. Educate people so they aren't burning actual rubbish, which is a fast track to rotten lungs. Educate people on how to build better ventilated houses. But replacing a reliable, locally sourced fuel with an unreliable, expensive fuel source isn't a solution. I come from a village where electricity is yet to reach us. Tap water is also a distant dream, let alone good roads. I may not add that children are sent away from school for lack of less than one US dollar school fees. so the reality of using firewood for fuel is also our reality. However, village wisdom has enabled our women to take care in the type of wood to use and self care in the cooking process. Of importance is to continue planting trees to keep the environment healthy. Dear Mr Kirk, Before pointing to the developing world through the women in the picture, care to study sum total of environmental impact by the life style developed countries. Dear Kirk, have you ever felt staunch smell in and around big business districts in CA during middle of the night? Have ever wondered those smokeless gases are and how do they impact our environment? Well, you will not worry about all that because no one will sponsor such studies and you would not want to put you livelihood and awards in jeopardy. But surely you can apply some common sense and calculate carbon foot print left by the household of lady in picture and your own house hold. Just account of amount of paper, plastic, cans, landfills and all sorts’ emissions and chemicals coming out of your household vs. household of the lady in picture. Btw, did you tell the lady about your intention of taking her picture and the way you are going to iconize her in your article – responsible for smoking the world? I'd hate to see your kitchen XJK. Hope it's just as "environmentally friendly" yet more attractive than the one shown in the picture. Do you bake fresh bread everyday? Besides, this article is about the health hazards of breathing cooking exhaust. You have not seen my kitchen. I bet you will not be able to afford a kithchen like mine.Come out od your small shell . You are really a lost baby. What shown here is not a health hazard. First learn about what a healthy living is. The lady here represent one of many unfortunate poor families strugling to meet their ends Such families are hardly any enviromental damage when compared to all the environmental damage caused by afluent life style. This article is all diverting real issue, serving larger corporate objective and getting an eye catchy paper published with a good potential of getting some awards. Certainly condtions of poor families need to improve in Asian and African countires. But a disoriented shallow research would only replace one problem with other. All these are very complex issues. You just worry about cleaing your kithcen and leaving as less cabon foot print as possible. Talking a lot about environment and presenting research paper with myopic view is not going to solve environmental problem. Environmentalist need not be just an instrument of corporation look for business opportunities on the name of environment. Developing countries have a lot of them. Please do air quality analysis of village where the lady in picture lives and city where you live before concluding upon causes of environmental burden. Life style of an average person in developing countries is much more environmental friendly and sustainable than most conscious environmentalist in developed countries. It has been part and parcel of their life for centuries. Importance of environment and nature is not newly found bird for them. So you will not find it on their lips but you will observe it well engrained in their day to day life style. Today in this country we trying to promote reusable bags. Did you know, most of the developing countries used reusable shopping bags made of cloths, paper and Jute until plastic bags got pushed in their market? People who carried jute bags were called unfashionable and backward. All those small and house hold business of making reusable bags gave up when plastics poured now. Once the corporations that wiped out those reusable bags are bringing them back and raking huge margin on it. Africans have plenty of sunlight but don't use solar cookers. What idiots. Africa is maily conisted of 3rd world countries. True they COULD use solar power, where would they get the money for it? Those solar panels are expensive. When should government force people to stop doing what they want to do? How many of these people who do smoke are not aware of the dangers of smoking? If they are aware of the dangers of smoking and still want to smoke, should we punish them for smoking? When is our safety, more important than someone else's freedom? If our safety is more important than someone else's freedom, and you are willing to take away their freedom to make you safer, how secure arfe your freedom's?